This was written as my closing address as chair of the 1998 Information Industry Outlook Conference, Saturday 7 November 1998 (Worthington, 1998). I argued that Australia should create a cultured image to market information industries. To support this I compared my experience in assisting ith a discipline review strategy for information technology in Australia and research into factors for the success of Cambridge (England) as a high technology industry centre. Australia can cultivate a cultured high technology image to develop and promote its information industries. The raw material of IT is talented people in a stimulating environment. Marketing of the products they produce can also be helped by the cultural reputation of where they produce it. Information Technologists tend to plan and theorise in the dispassionate languages of science. Investors and policy makers talk about IT R&D investment decisions in the dispassionate language of commerce. However, there are other powerful motivations for decision making in information industries. Politicians and voters want a vision of what can be accomplished through IT. Researchers and investors considering where a research or development facility should be located will be influenced by the reputation of the place. The customers of products produced from the research will also be influenced by the cultural quality of the place it was developed. Perceptions perhaps have also played a role in the lack of action on IT policy by Australian governments. The needed actions have been detailed in expert reports. However, these did not use a language which business and government leaders understand. This document discussed the results of one major work on IT policy, which the author was involved in preparing a discipline research strategy for information technology in Australia (Worthington 1997). This is contrasted with results of research into factors for the success of Cambridge (England) as a high technology industry centre. Australian companies and governments can position Australia for an information economy future. Contrary to conventional wisdom, it is suggested that economic development comes from growth of local companies and through technology transfer to multi-national companies. The report``Sink or Swim - Discipline Research Strategy on Information technology'' was officially released 18 September 1998, by the Australian Academy of Technological Sciences and Engineering (AATSE 1998). It examined the situation of research in Information Technology (IT) in Australia and aimed to show how the nation could gain increasing benefit from its investment in the discipline. The report was commissioned to prepare a strategy for the development of research in information technology (IT) in Australia over the next 10-15 years. It was to make recommendations for research in IT disciplines, to strengthen their contribution to the economic, social and scientific welfare of Australia. The report presents a vision of a healthy, productive and reputable program of research activity supporting Australian industry and society. However, it showed that reality falls short of this vision, with the scale of IT research in Australia much smaller than is warranted by the importance of the discipline. The report argues engineering and information technology need the sort of support that agriculture and medical research receives in Australia, as the knowledge economy takes over. The one hundred-page report by government, industry and academic experts took two years to write. It was funded by the Department of Employment, Education, Training and Youth Affairs (DEETYA), with additional funding and expertise from the ACS. My role, as a member of the steering committee, was to push the academics along to produce the report on time and to make it of practical use. Perhaps the most important point in the report is about the benefit that comes from the pool of skilled people which research provides: Transfer of knowledge into industry is more from personal contacts and movement of personnel than from published information. Industry gains more benefit by employing highly trained individuals to carry out research and development than it does by reading the research literature. The first group of recommendations covered recognition and rationalisation of research funding by the federal government. These aimed to provide coordinated and focussed research programs. To rationalise their funding mechanisms it was recommended Government funding bodies and research agencies have a priority setting process, similar to that of CSIRO (Recommendation 1). There was no focus on IT research funding by the ARC. In response, recommendation 2 was to have a specific funding category called ``Information Technology'' and assess all applications in Computer Science, Computer Engineering, Software Engineering, Digital Communications and Information Systems under it. Because of the importance of computer programs and systems to IT, recommendation 3 suggested these research contributions be recognised in assessing grants, rather than just counting how many papers the applicant had published. Recommendation 4 covered international research collaboration. It was suggested the Department of Industry, Science and Technology (DIST) and DEETYA establish a funding mechanism to increase the collaboration and the ARC fund specific grants for Australian postgraduate students to visit overseas research facilities. Areas were identified for Australian research organisations to participate in international consortia: International broad band communication networks and next generation Internets; Geographical and Spatial Databases; Intelligent Manufacturing Systems; High Performance Computing and Communications (Recommendation 5). These sections dealt with the issue of encouraging IT research for Australian industry sectors, where there are very few large locally owned companies to fund the research. To address this, recommendation 6 was that 25% of the funding for CRCs should go to IT. Australian universities should allow academics from IT departments to spend time working in industry and this should count for promotion (recommendation 9). A World-Wide Web-based registry of current research capabilities and activities, plus structured industry forums and workshops was recommended to improve the flow of information about the strengths in Australian IT research to industry (Recommendation 10). The concern here was for better academically qualified students to be attracted into IT at the tertiary level, to produce high calibre researchers. DEETYA and State Departments could encourage more high achieving school leavers to enter IT courses at the tertiary level. State Governments could improve IT curriculum and teacher competence at the primary and secondary level (recommendation 12). IT costs money in laboratories, equipment, software and technical infrastructure. It was recommended funding be equivalent to those applicable to the laboratory based physical sciences and electronic engineering (Recommendation 15). One Federal Government portfolio for the information industries, covering telecommunications, information technology and the media was recommended. This would provide a broad, coherent strategy covering all industry, commerce, education and research sectors (Recommendation 16). Professional and industry organisations including the Australian Computer Society were asked to co-ordinate and conduct presentations on key IT issues including current research to the public and government bodies. The work of the National Science and Technology Centre and the Powerhouse Museum raising awareness was acknowledged (Recommendation 17). Why was the Report Ignored? The report Sink or Swim was extensively researched and backed by government and the industry. It argues engineering and information technology need the sort of support that agriculture and medical research receives in Australia, as the knowledge economy takes over. Given such an important topic and well reasoned arguments, why has the report had so little impact? In the Cambridge phenomenon (Segal 1985), Segal Quince & Partners argue that the growth of high technology industries around Cambridge came from informal contacts, modest locally arranged financing and organic growth from existing small independent companies. This report can be difficult to find (it predates the web), so I have prepared a summary at Appendix A. This approach differs from that of Australian governments, which assume that high technology investment and expertise must be attracted from elsewhere, preferably from another country. The emphasis has been on attracting branches of large, established, national or international organisations, using marketing and financial packages targeted at company CEOs. It is assumed that economic development will come from these companies employing local staff and, in some way, from technology transfer to locals. This cargo cult approach by Australian governments is not supported by the Cambridge experience. It can be argued that, with the growth of the Internet, Australia is well positioned to develop its own information industry to compete on the world market (Worthington 1997b). What might be lacking is self-confidence by those in the industry, the business community and our political leaders to exploit local talent. As well as well educated IT personnel and a suitable business environment, Australia needs to have a reputation for a suitable cultural environment. Whereas Cambridge obtained that reputation naturally, over a long history, Australia could cultivate one in a few short years. While using the local market to develop products and sustain operations, Australian companies can market to the world. Parts of Australia have a similar non industrial character to Cambridge, with major cultural institutions. This can be built through deliberate marketing to create an international reputation as a cultural and innovation centre. The Internet provides an ideal on-line marketing tool. Australia already has Internet sites, with international reputations and other centres which could be made world famous on-line, very quickly. These sites can be exploited to market Australia and create a reputation for culture and innovation in months, rather than centuries. The IT industry and research community need to market not only the results of their work, but plans for expanding the R&D effort. The Australian IT R&D report failed by addressing only the R&D community in the dry language of science. 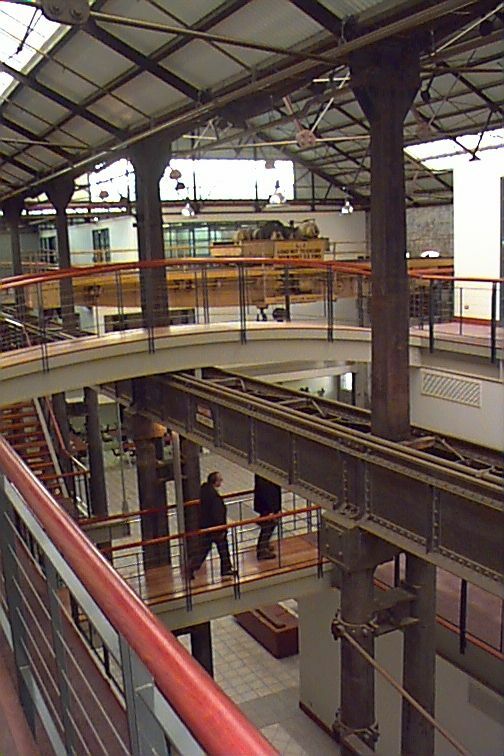 example of an Australian centre combining culture and technology is the Australian Technology Park (ATP) at the old Eveleigh Railway Workshops, in Sydney (Worthington 1998). This contrasts with the barren landscape and disappointments of the MFP Technology Park in Adelaide (Worthington 1997c). ATP has considerable unrealised potential as a marketing tool for Australian R&D capabilities. In addition to high technology facilities, the site includes a railway workshop museum and a major music teaching and performance facility. ATP, perhaps more by accident than design, has similar elements to the City of Cambridge, for creating a marketable cultural and high-technology image. The Australian Technology Park involves the University of New South Wales, the University of Sydney and the University of Technology, Sydney. According to the ATP home page: The ATP is being developed by the Australian Technology Park Sydney Limited, with the support of the New South Wales State Government. The project has also received financial support from the Federal Government, under the Building Better Cities Program. The ATP is located at Eveleigh, to the south west of the centre of Sydney, next to Redfern Station. The Eveleigh Railway workshop buildings have been sensitively upgraded to include modern offices in the shell of the old. Access CMC is the Co-operative Multimedia Centre established in New South Wales. Members include Telstra, NSW Department Education and Training, University of Sydney, University of NSW and multimedia companies. Sydney Conservatorium of Music: One of the unusual inclusions is the Sydney Conservatorium of Music (The Con). The Sydney Conservatorium of Music is a faculty of the University of Sydney. It offers tertiary programs at graduate and undergraduate levels, and non-tertiary programs through the Conservatorium High School and the Conservatorium Access Centre. The Con is at ATP until its usual home in central Sydney is refurbished. While a music faculty wouldn't at first seem to fit with a high technology park, it makes a lively atmosphere. The Grouputer is a multi-user system for group collaboration. The Australian Defence Force Academy was an early Grouputer user, for experimental use in Defence decision making. From: Review of ``Railways, Relics and Romance: The Eveleigh Railway Workshops'', by Anthony Browell, 1996 Architecture Media Australia Pty Ltd. The Roman writer Cicero termed what we would call the cultural landscape a second nature (alteram naturam). This was a landscape of bridges, roads, harbours, fields - in short, all the elements which men and women introduce into the physical world to make it more habitable, to make it serve their purposes. In closing the ACS Canberra Branch Conference in 1995, on Internet and multimedia, I drew a connection between 18th century English landscape architecture, the design of the city of Canberra and the information super highway (Worthington 1995). In 1996 in the keynote address to the ACS Canberra Branch Conference I argued that Australia in general, and Canberra in particular, could become the world's leading centre for use of Internet technology for administration (Worthington 1996). Perhaps we can build both the mystique and the reality of an IT Arcadia, using the technology to promote Australia as a place in which to develop high technology products and somewhere to buy them from. Australia can cultivate a cultured high technology image to promote its information industries. The success of Cambridge as a high technology industry centre provides a model for Australia. The discipline review strategy for information technology in Australia provides a blueprint for our IT research. Contrary to conventional wisdom, economic development in IT comes from growth of local companies and through technology transfer to multi-national companies. Australian companies and governments need to take steps to position the nation for in this information economy future. Which of the IT Research Strategy recommendations were implemented? What links are there between links between railways and IT? How many technology parks are there in Australia? What trends have there been in their development? Which member of the IT Research Strategy steering committee worked in Cambridge on computer design? How many decades ago? What was the computer called?